Part of what makes us human is the way we are able to use our hands. Effective and skillful hand usage requires stable, painless movement of the elbow joints. 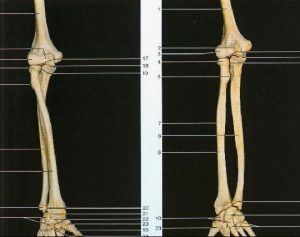 Since the elbow bends and straightens much like a door hinge, it is often referred to as a hinge joint. But when the complex interaction of elbow, forearm and wrist is fully understood, it’s easy to see why dysfunctional elbow mechanics is a major contributor to forearm and hand pain. As you can see in the figure above, the elbows intricate design provides maximum stability while allowing optimum forearm mobility so the hands can accomplish daily tasks. The elbow is actually comprised of three separate bony articulations; the ulnohumeral, radiohumeral and the radioulnar joints. 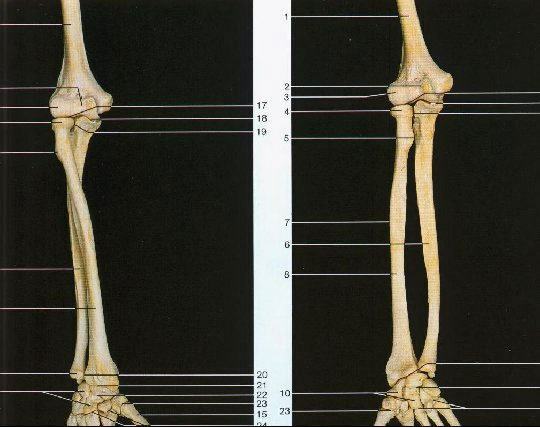 Movement between the ulna and the humerus occurs at the ulnohumeral joint, radius and humerus at the radiohumeral joint and radius and ulna at the radioulnar joint. While ligament and muscle integrity is required to support and move these joints, a loose-fitting capsular “bag” provides necessary fluid production for efficient joint functioning. Although the humeral and ulnar bones do flex and extend much like the hinge on a door, the humeral and radial articulations are much more complex. Shaped like a contoured knob with a cup at the end, the elbow’s radial head glides smoothly as it articulates with the humerus and ulna. As the radius rotates around the ulnar bone, the radiohumeral and radioulnar joints can turn the palm up (supination) or down (pronation). The radial, ulnar, and median nerves must traverse down the arm and pass across (and sometimes through) the elbow transmitting signals from the brain and spinal cord to muscles that move the forearm. Conversely, the brain relies on nerves and finely tuned sensory receptors in skin, fascia, ligaments, muscles, and joints to relay vital neurological information back to the cortex regarding sensations such as touch, pain and temperature. As each nerve travels through its protective tunnel and crosses the elbow, it must bend and twist during all forearm movements. Regrettably, constant bending, twisting and straightening can cause irritation and pressure on the nerve’s capillary beds and dural membrane…especially in motion-restricted joints. As these neural soft tissues degrade, a chemical cascade of inflammatory waste products infiltrates the injured area often resulting in intraneural edema, pain, numbness, and weakness in the arm and hand. 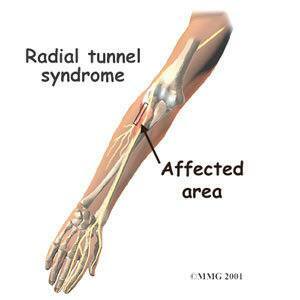 Many pain syndromes arising from the lateral and medial epicondyles are blamed on micro-fiber tendon tearing. Although inflammatory tendinitis usually presents in acute stages of tennis and golfer’s elbow, in time, toxic waste by-products dehydrate and the resulting fibrin deposition creates collagen cross-linking. 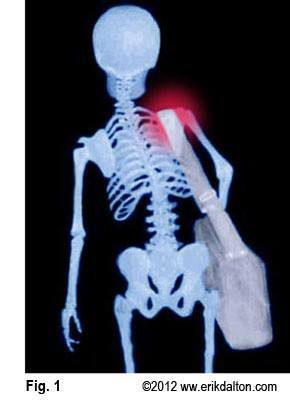 This commonly seen chronic condition is termed tendinosis. Traditionally, cross-fiber frictioning and myofascial spreading techniques have been successfully used by bodyworkers in correcting many soft tissue elbow injuries. However, therapists often become frustrated when clients return week-after-week complaining of the same pain. As discussed in my Advanced Shoulder, Arm and Hand video, I’ve found that a missing piece of the pain puzzle often lies in bony restrictions limiting joint range of range of motion during elbow supination, pronation and extension. Try incorporating the muscle energy joint mobilization techniques in the photos below prior to assessing and treating soft tissue lesions. You may find that many chronic elbow and forearm problems suddenly disappear as full mobility is restored to motion-restricted joints and associated soft tissues. As joint mechanoreceptors sense restoration of normal mechanical movement and joint play, the brain often releases protective muscle guarding allowing tension to be removed from strained fibers and compressed nerve tunnels. A recently published study in Manual Therapy Journal by Abbott, Patla and Jensen (Aug; 6(3): 163-9 2004) found that a significant percentage of double blind subjects presenting with lateral epicondylalgia (tennis elbow) demonstrated a favorable response to muscle energy (contract relax) joint mobilization maneuvers for extension, pronation and supination. Twenty-five subjects with lateral epicondylalgia participated. In a one-group pretest – post-test design, the study measured (1) pain with active motion, (2) pain-free grip strength and, (3) maximum grip strength before and after a single intervention of muscle energy. Results of the study indicate that muscle energy mobilization was effective in allowing 92% of subjects to perform previously painful movements pain-free, and improved grip strength immediately afterwards. Significant differences were found between the grip strength of the affected and unaffected limbs prior to the intervention. Both pain-free grip strength and maximum grip strength of the affected limb increased significantly following the intervention. Pain-free grip strength increased by a greater magnitude than maximum grip strength. The researchers concluded that muscle energy joint mobilization routines offer a promising alternative intervention modality for the treatment of clients suffering lateral epicondylalgia.